Braces are an old favorite of orthodontists the world over; they are proven to work time and time again and very few people come away without a satisfying result. This is why it’s always a hot topic. Not long ago though, we had very few options at our disposal except for the classic metal brace when it came to aligning your teeth effectively and without invasive surgery. With the advancements in the dental industry, we now have access to better equipment and resources to give clients, one of them being clear braces offering a translucent visual appearance. Now, clear braces aren’t a new headline, they have been around for a while, but there are still a couple of misunderstandings between clear and metal braces. So let’s ‘clear’ up three of the most common questions asked when it comes to the two options. 1. Do clear braces work the same as metal braces? Yes, the only difference is that they are clear and blend more naturally with your teeth, making your smile more aesthetically pleasing (which is a big winner for the high school years). 2. Are clear braces harder to maintain? 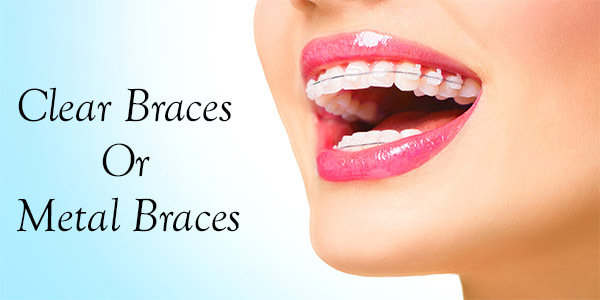 No, it is the same cleaning and maintenance routine as the traditional metal braces. 3. Do clear braces take longer to work? This is a big question as it can appear too good to be true, same results, same cleaning routine and they are practically invisible. Fact is they do produce the same results as the metal. So if you’re asking yourself which one is for you; clear or metal? Truth be told, they are equally as effective, one simply is clear and far more aesthetically pleasing while the other gives you a far more traditional look. It may only be a very simple difference but when it comes to an area of your body that’s hard to hide throughout your day, that one ‘clear’ benefit is a standout and we are excited to offer it within our practice. Here at Modern Orthodontics we are passionate about clear braces as they enable fast results, while still being more discreet than traditional braces. We encourage you to ask any questions that we may not have already addressed. If you would like to learn more, or to request an appointment, please contact Modern Orthodontics.